EVERY 17 SECONDS SOMEONE IS NEWLY DIAGNOSED WITH TYPE 2 DIABETES. American Diabetes Association needs help to fund critical research, advocacy and comunity based outreach. 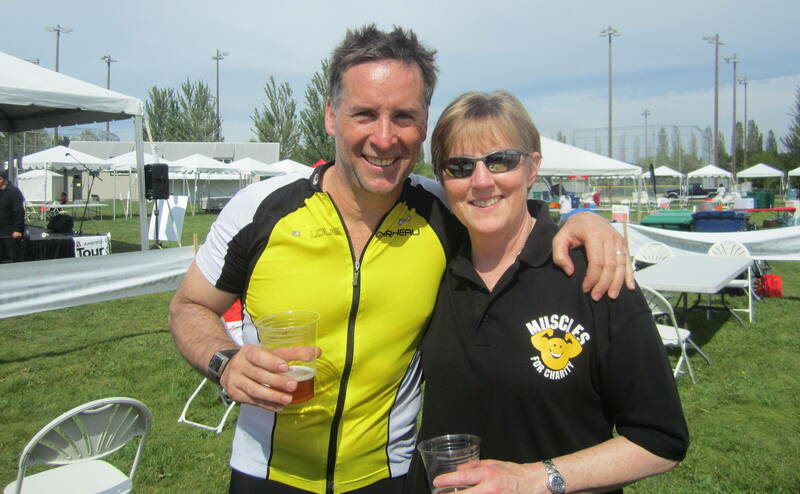 Since 2004 Muscles team members have been involved in riding (up to 100) miles at the annual Tour de Cure. 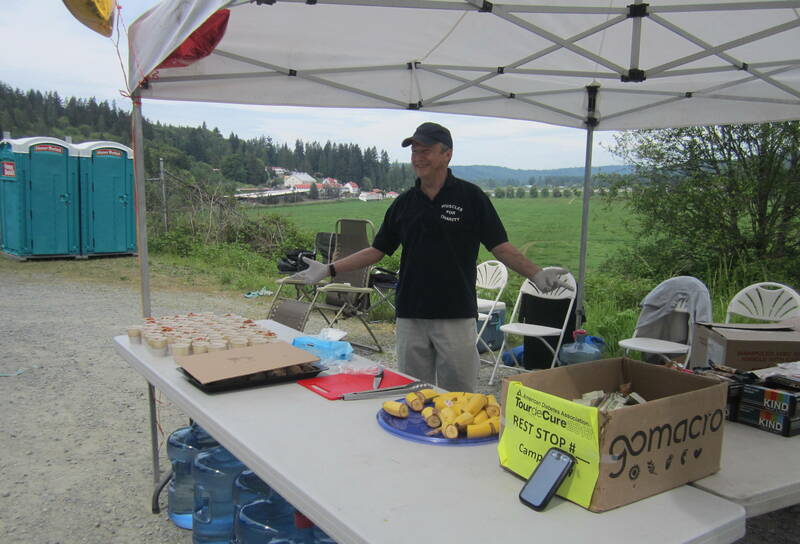 On Saturday 11th May 2013, Muscles volunteers again rode in the event and operated the Camp Korey Rest Station. In fact their display drew such an audience that Fred was left to handle things himself ! 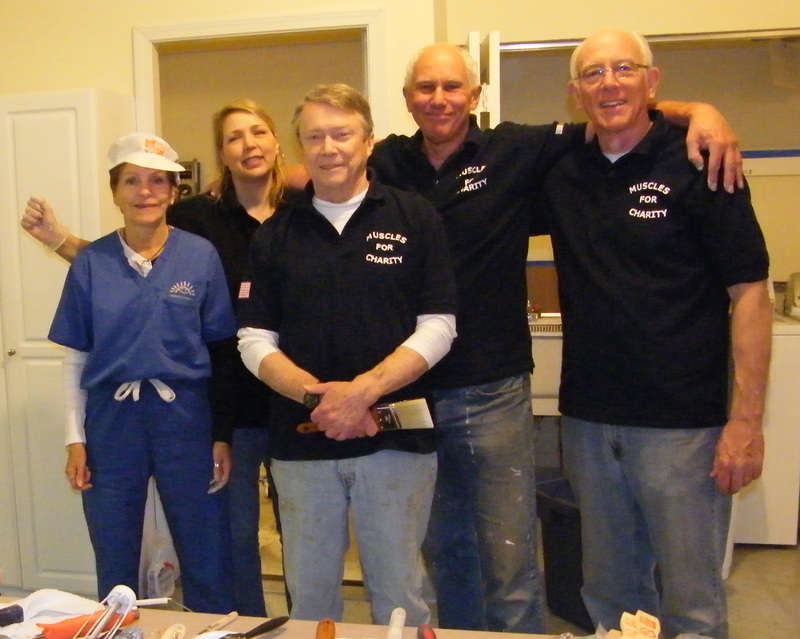 Eventually the rest of the volunteers – Sheri, Glenna, Suzanne, Bill, Amy and Kelly returned ! For the second consecutive year, Frank and Hoby cycled 100 miles. Ody congratulates Frank for raising over $1,000.00 in sponsorship. THANK YOU to everyone you contributed to another very successful team day. Visit www.campkorey.org to learn more about supporting children and families affected by serious illness, and how the 818 acre camp offers therapeutic recreation programs, free. Visit www.diabetes.org/tour for information about ADA and the annual Tour de Cure. 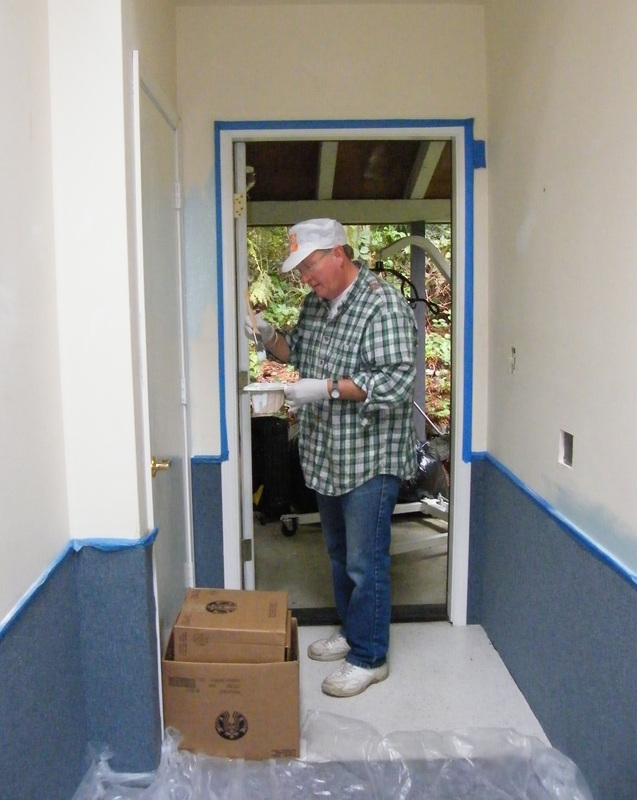 The strong bond of friendship and co-operation between Muscles volunteers and Bellevue, WA based ‘Helping Hands for the Disabled’ was displayed when fifteen members of the Muscles team redecorated ‘Visions House’ in Kirkland on Saturday 13th April. 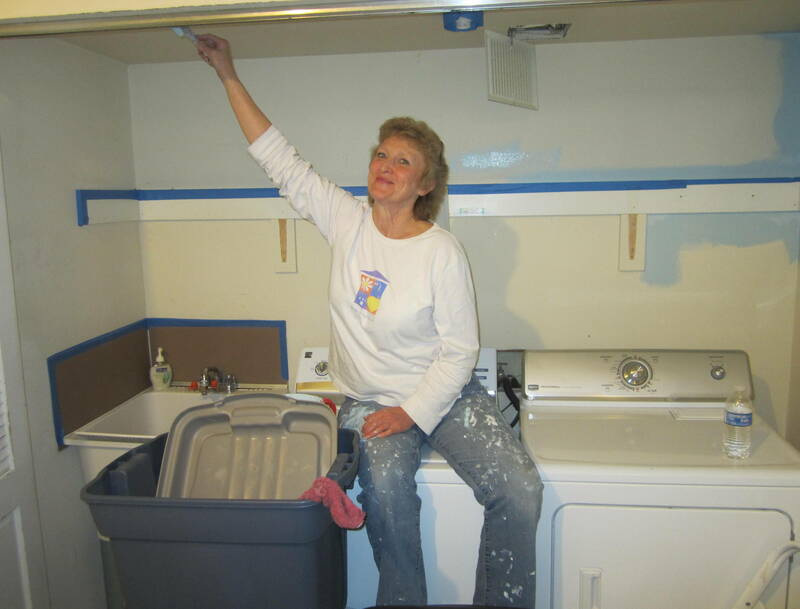 Pride, laughter, commitment, friendship, hard work and aching muscles marked a ten hour day of painting. 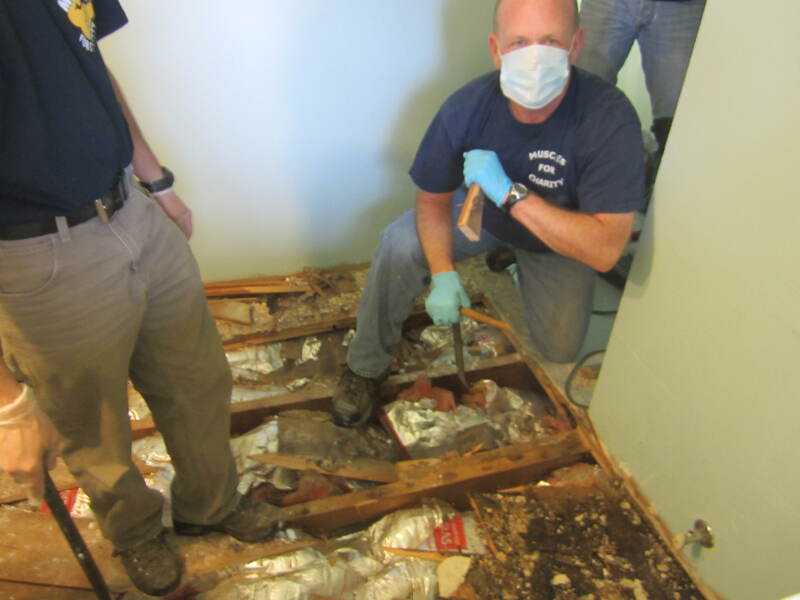 Cyrus, Eric and Bill volunteered to examine a plumbing problem in one of the toilets and were quickly enveloped by effluent odours and sewage. 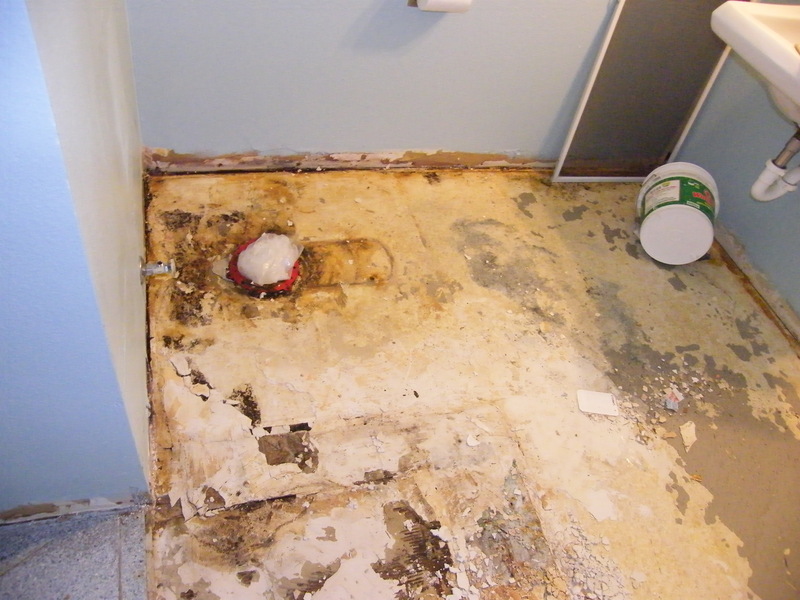 Their combined skills ensured the successful replacement of plumbing and flooring. Great job. Thanks everyone. 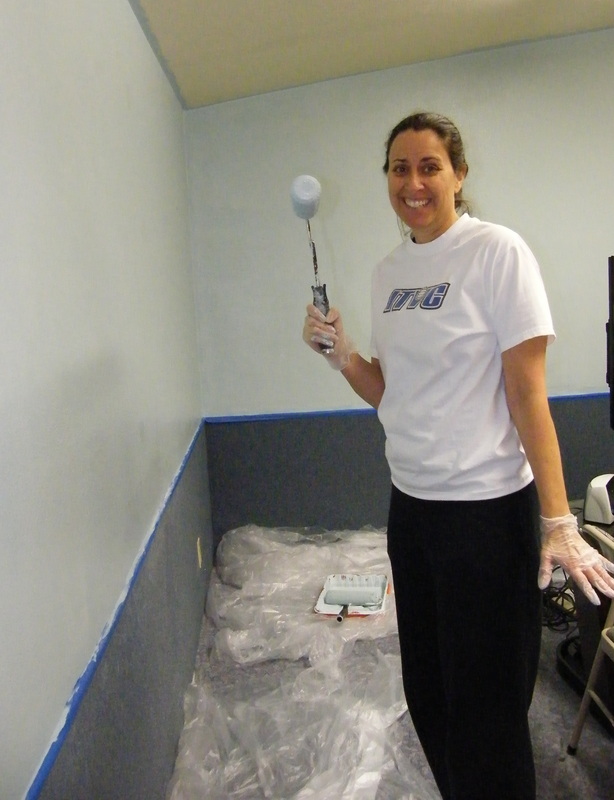 Don’t forget Eva’s promise, “No more painting jobs” ! 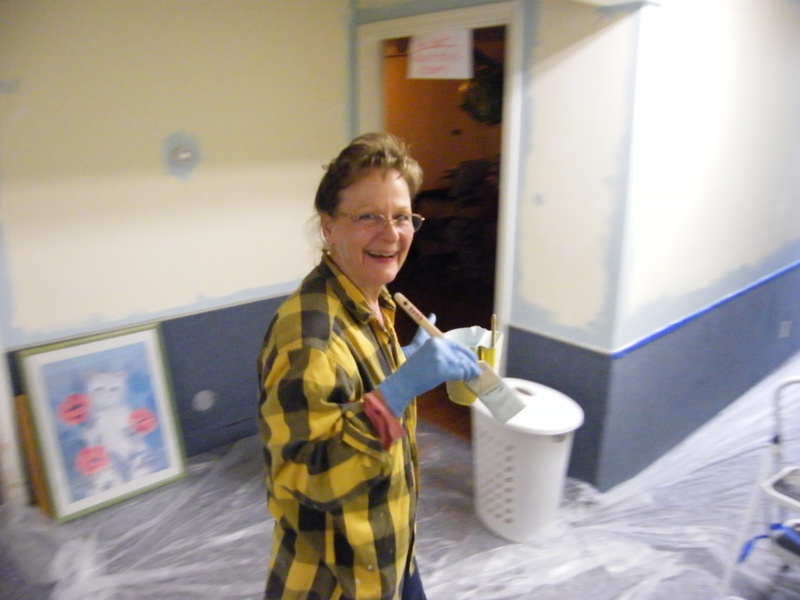 However, the next US Muscles job turned out to be – ‘yes, a painting job’ Mid July, and Jennie Skidmore-Doe ( from San Antonio, Texas) invites Glenna and Bish to help paint the interior of a house in Elmer, WA. 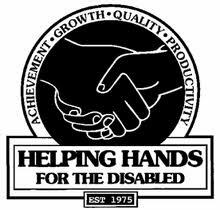 The three day marathon provides Jennie with an insight into the ethos and track record of Muscles volunteers, and she “wants to support the team”, by making a donation from the Howard Skidmore Trust to Helping Hands for the Disabled and joining the team. Welcome aboard, Jenni, and ‘hey – its a heck of a commute to jobs !!. Helping Hands Auction and Supper – 007 Bond themed ‘Live and Let Bid’ Muscles volunteers filled two tables at the October Auction in Bellevue, which was hosted by Auctioneer Graham Crowe, and raised tens of thousands of dollars for Helping Hands. 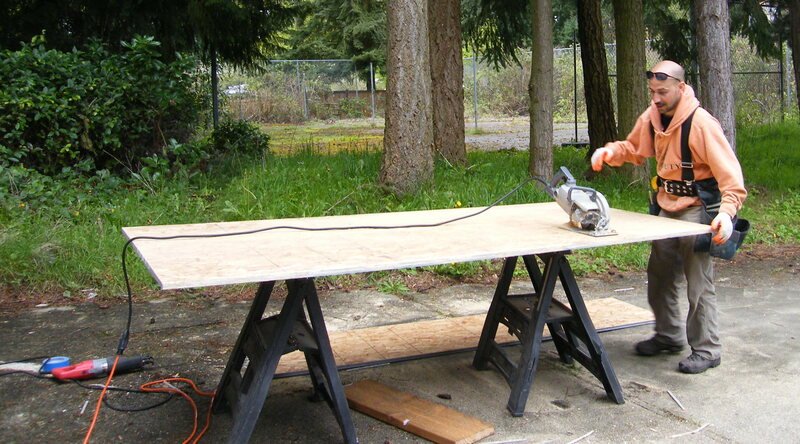 Early in 2014 the Muscles volunteers will be clearing land at the back of the main building in preparation for the erection of a large storage shed (and porch), a permanent walkway and additional painting inside the house for the residents. and probably one of the most unusual Muscles jobs in our 15 year history !! 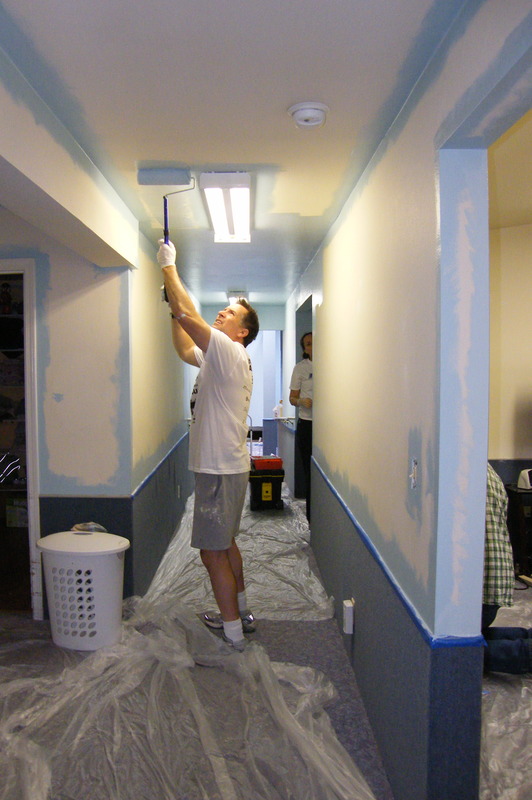 For three months from late September 2013, the homeless community – entitled ‘Camp Unity’ were based at the rear of a Methodist Church in Bellevue, WA. Saturday 2nd November witnessed the stormiest day of the year and over 200,000 local residents without power. 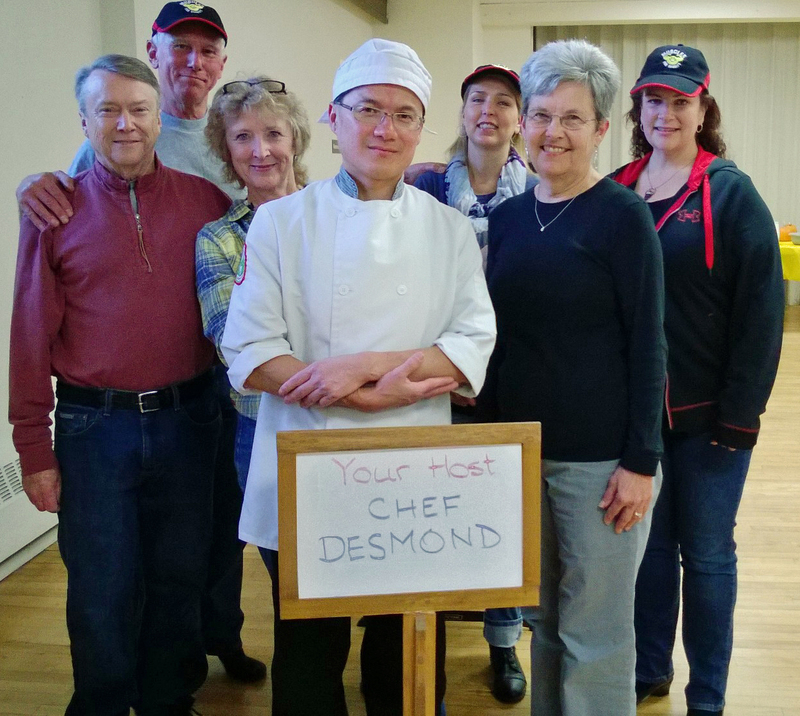 Fortunately, power was not a problem at the Church where Chef Desmond produced a gourmet meal for the homeless residents, assisted and supported by his wife Sylvia, and Muscles members – Sheri and Fred Yeatts, Joie Worthen, Teya Edburg, Glenna Trout and Bish. A memorable evening, enjoyed by everyone in the team and the Camp.